Our luxurious dive boat and dive vessel is a safe and spacious platform for our diving activities. 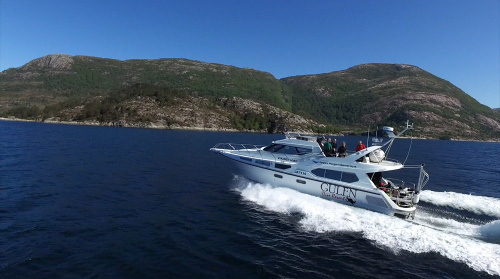 Our Dive Yacht is fast, and it helps us to reach our dive destinations in a short period of time, and it is stable in the sea. It has a custom built dive deck that is constructed to give you a smooth preparation to enter the water. We use a dive lift to pick you up and onboard we have also an air-bank with a capacity to refill our bottles between dives. Our RIB is a 35 feet long (Rigid Inflatable Boat) is a fast and very steady option that we use on some dives and locations. It´s reliable and one of the largest and most solid built in Norway. It has storing capacity and dives leather to get on board, also equipped with a tent so it´s possible to sit inside during the trip. All our dive boats are equipped with all modern navigational aids, radar, VHF radio beside all safety aids that are necessary to keep all drivers safe during our day excursions. Of course also oxygen kit in case of emergency. On the following pages, you can read more about our compressor and blending facility, rental tanks and the dive resort in general.